There is a very busy schedule of work this week, starting with GNSO and GAC sessions through all of Saturday and Sunday and then following the usual ICANN meeting pattern following the Opening Ceremony on Monday morning. For a list of events according to day, please click on the links below. Welcome to 30th meeting of ICANN, held at the LAX Hilton in Los Angeles. Registration opened on Sunday morning, adding to the 895 pre-registrations. It is expected to be ICANN largest ever meeting. And for good reason: two of the biggest issues ever to strike the domain name system – Internationalized Domain Names (IDNs) and new generic top-level domains (gTLDs) – are high on the agenda. Plus of course the departure of Vint Cerf as chairman after nine years at the head. 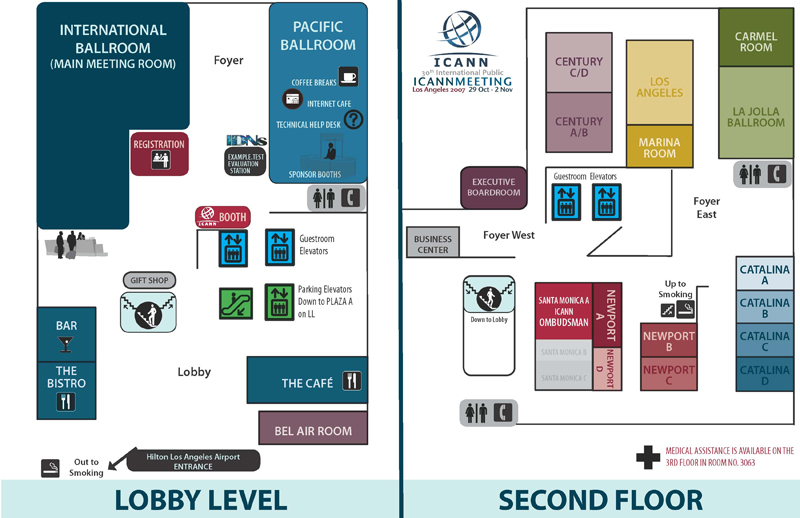 Tuesday is “Constituency Day” where the different elements of ICANN’s supporting organisations hold their own meetings to discuss the latest developments and their positions on matters likely to be raised later in the week. With the exception of the Governmental Advisory Committee, they are open to observers. The evening will see the Gala event at the Sony Studios with a special tribute to Vint Cerf. Tickets are limited to 800 so pick them up early at the registration booth. Wednesday is supporting organisation and workshop day. The GAC spends all day drawing up the rough draft of its communiqué; the GNSO Council makes its decisions; the other supporting organisations get down to discussing what they had drawn up the day before; and the broader views of ICANN’s work are discussed in public meetings. A run of three big meetings take place in the afternoon in the main room: a discussion of the IGF, review of new accountability framework, and translation. Thursday is dominated by the Public Forum. It should be a lively affair. A number of big policy issues have cropped up at the Los Angeles meeting, including Internationalized Domain Names (IDNs), new generic top-level domains (gTLDs), IPv6, ICANN’s Strategic Plan – outlining the organisation’s path forward – as well as the finalizing of a set of new Accountability and Transparency principles. Plus of course it will be the last time that Vint Cerf chairs an open forum. Expect noise and laughter. The final day of the meeting comprises one event. Since it is the annual meeting there will be not one but two Board meetings. The first will be as usual – the Board discussing the issues and making decisions on the work put before it. That meeting will then close and the new Board members will take their places and hold a second meeting – with the most important agenda item being the vote for a new chairman. Then it will close and preparations will begin for Delhi in February. See you there. Otherwise, we have a full search with results filtered according to date, organisation, subject and type on an overall schedule page.